The story involves a young woman named Jyn Erso (Felicity Jones), whose father (Mads Mikkelsen) is a brilliant scientist pressed into the Empire’s service. The Rebel Alliance has gotten word that the Empire is constructing a terrible new weapon called the “Death Star”, which can destroy entire planets, and that Jyn’s father is the chief architect. The Rebels abduct Jyn hoping that she can lead them to her father, whom they plan to kill before he finishes work on the weapon. Along the way, however, it is discovered that Jyn’s father designed a flaw into the Death Star that can be exploited by the Rebels and allow them to destroy it completely. This changes the objective and the new plan becomes a virtually impossible mission to get the Death Star design plans into the hands of the Rebels. Jyn is helped along in her mission by a weather-beaten Rebel operative named Cassian Andor (Diego Luna), his sarcastic robot K-2SO (Alan Tudyk), a blind Jedi monk (Donnie Yen), a cynical soldier (Wen Jiang), and an Empire defector (Riz Ahmed). Like last year’s The Force Awakens, the film is centered around its well-defined, relatable characters. Jyn tries to project an inner strength, and Jones plays her with just the right amount of fragility. This is a woman that has been without any real love most of her life, which explains both her tough-as-nails exterior and her deep sadness. Diego Luna plays Cassian as angry and tired; a man who, by his own admission, has been a part of the Rebellion since he was a young child. Cassian is still a true believer in the cause, but it’s becoming clear – to him and to us – that while he doesn’t doubt his motivations, he’s starting to see his actions as futile. The rest of the cast is equally effective, each understanding their character’s driving motives and essential personalities. Tudyk, unsurprisingly, operates as comic relief, and lands every joke perfectly. Special attention should also be paid to Donnie Yen, whose blind-but-lethal monk is – on paper – nothing particularly special (after Daredevil and Book of Eli, the novelty of hyper-capable blind characters has worn off a bit). However, Yen imbues the character with such fervent devotion to the Force that he could even be seen as a bit fanatical by the audience, were he not the sole source of optimism in this increasingly-cynical world. Yen and Tudyk craft characters that are so essential to a film like this; they fill in the gaps of this fantasy world and provide much-needed flavor. By establishing such an eclectic ensemble and then throwing them into the midst of an impossible situation, I was reminded of George Lucas’ intentions with the first Star Wars film. While much of his focus was on evoking 1930s science fiction serials and the work of Akira Kurosawa, he was also heavily influenced by World War II newsreel footage and action pictures, featuring the mid-air dog fights between American and Japanese fighter pilots. And while the space battles in Rogue One are indeed very exciting, the movie’s tone actually put me more in mind of war films like Saving Private Ryan and Platoon. In most war films, there is a certain fatalism to be found in the shared glances between characters and the quiet moments of introspection. This film certainly contains that fatalism, especially when we consider that the eventual goal – the destruction of the Death Star – is achieved, but that any victory comes at a terrible cost, and these characters are the ones to pay it. 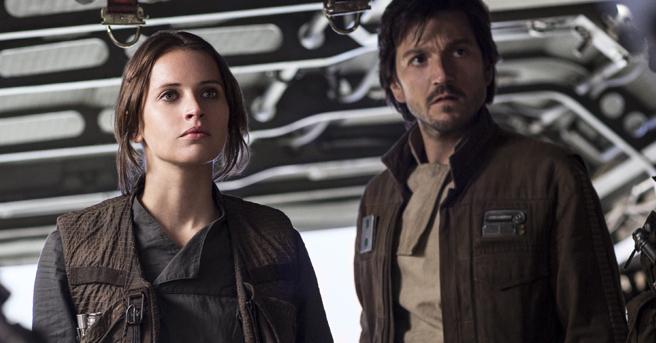 These elements set Rogue One apart from the rest of the series. While Anakin Skywalker, Obi Wan Kenobi, Han Solo, Yoda, Princess Leia, and countless others are the major players in the saga, this film tells the story of the unsung heroes, whose perseverance and sacrifice allow the larger victories to be won. By telling this story, the universe of Star Wars expands to include those on the sidelines, whose lives are deeply impacted by the Empire, but who will never be remembered when it’s all over. This idea is so effective for me that it becomes very frustrating when Edwards and his writers deviate from the primary story in order to connect the events to those of A New Hope. Whether it be the brief cameos of certain characters or the heavy inclusion of Darth Vader, the laughs of recognition in the audience served more as a distraction than any possible deepening of the story. This is especially – maybe even fatally – true when we see Grand Moff Tarkin, played in A New Hope by the late Peter Cushing. Here, rather than casting a lookalike, Edwards opts to recreate Cushing’s face digitally. This is a terrible idea, and it brings the film to a grinding halt any time Tarkin is on screen. No matter how advanced CGI technology gets, audiences will always be able to see the seams, especially when attempting to recreate the nuances of a human face. While I understand the instinct to create as many bridges between this and later films as possible, the decision to include Tarkin in this way is so frustratingly distracting that it baffles me that so many people – from the director to the executives to the writers themselves – were okay with it. Despite these moments of shameless fan service, Rogue One remains a very entertaining and moving film. It does not only what a great Star Wars movie is meant to do, but what any great war film absolutely must do: it creates a tangible world and peoples it with grounded, believable characters that we care about. My hope is that, as this series continues, future filmmakers will be less inclined to tip their hats to the original films in hamfisted, obvious ways and simply tell their stories. Because Rogue One has a great story to tell, and one that is worth telling. And, considering that it’s the eighth film in a franchise, that fact alone makes it something truly special. I appreciate your straightforwardness about the flaws. Sometimes those are good to know about ahead of time. With the surprise of them gone, they may sting us a little less.